I loved this one. Will definitely share with my 10 year old daughter (something I can't always say about your comics). And your artwork is really sublime. On t-shirts for sale online? I tried clicking the image for page two. Seriously, this needs to be just the beginning of your children's book, due out in time for Christmas season. Great stuff. brammofan: Thank you! It's good that I can draw something for all ages. As a side note, my dad gave me his collection of somewhat inappropriate comics (e.g. B. Kliban, Life in Hell) when I was young. But I think I was in my teens. Davey: I promise a children's book. Maybe not by Christmas, but at least within the next 5-10 years. I look for your comic faithfully every week in the KC Star. You always come up with a great concept and great artwork! Let me repeat the advice I gave once before.. your work would go over even better if it had a punchline. You need a punchline! The last panel needs to stand out from the others. Make it be something that deserves an exclamation point. Make it look as if the last panel was the purpose - what you were building up to from the beginning. This week's strip is a good example how easy this can be. 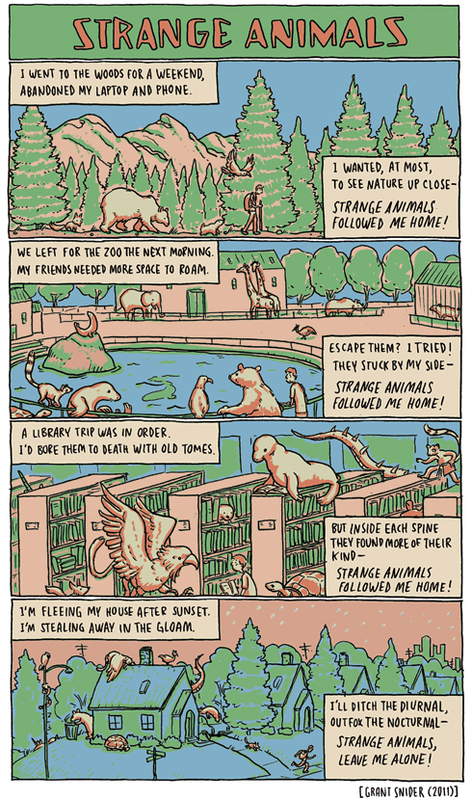 In all the panels but one, make the "strange animals followed me home" refrain a simple lower case statement, like you're not surprised by it at all, happens all the time. Then the point of the last panel is that your patience has finally run out, so exclaim as you do, "STRANGE ANIMALS LEAVE ME ALONE!" Great comic. It made me smile. And in times such as these anything that makes you smile helps to ease the burdens you carry. Bill K: Thanks for the feedback. I halfway agree with you. Some of my comics need an extra jolt at the end, though not necessarily a traditional punchline. As for the quieter ones, I think they're sometimes better left open-ended. But it's definitely something I need to consider in the writing process. It's easy to come up with the opening lines of a comic, but harder to finish with consistency. I am totally in love with this! Your work is absolutely fantastic!